In case you missed it, YouTube India is hosting 'Comedy Week' from 5-12 September. The theme is ‘106% funny’ – don’t ask me what that implies but if you do find out, let me know. This content special from YouTube pulls together existing humour videos and exclusive web content specially created for the event. As a result we have a unique, first-rate, funny video mash-up. The content includes iconic Bollywood scenes, regional movie clips, curated videos from across publishers on YouTube spanning TV, animation, mimicry etc. There is exclusive content created by the likes of Vir Das and Cyrus Broacha and celeb endorsements. 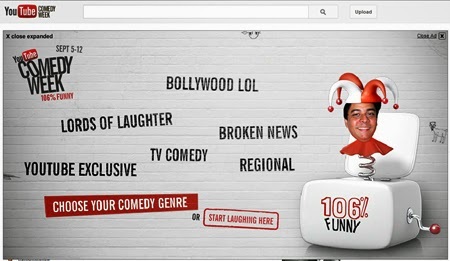 On September 5th, YouTube hosted an expandable interactive Masthead on the Home Page which introduced the event and let users select a comedy genre within the banner to check out related videos. 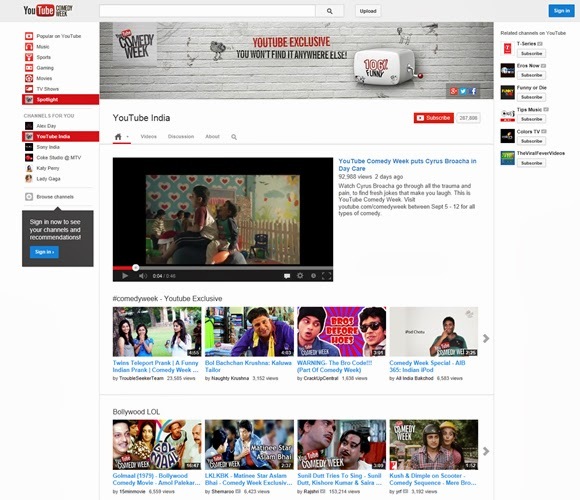 A special YouTube logo unit has been constructed to link directly to the YTIndia page. This is an excellent effort which helps content publishers and (therefore) YouTube as well. It brings quality genre-specific videos to the front and accelerates subscription to sub-channels, which in turn increases content stickiness.